The image of Buenos Aires is alive and well in our collective imagination. Tango dancers and bandoneÃn players, mate (the national beverage), the nightlife, the sheer energy and enthusiasm of the porteos all contribute to the growing popularity of Argentinas capital. Buenos Aires is a city that seems to be constantly building its identity, trying to find a place for itself between its European past and its Latin American present. The city is vibrantly alive and just letting yourself get lost in its streets is certain to reveal hidden treasures. 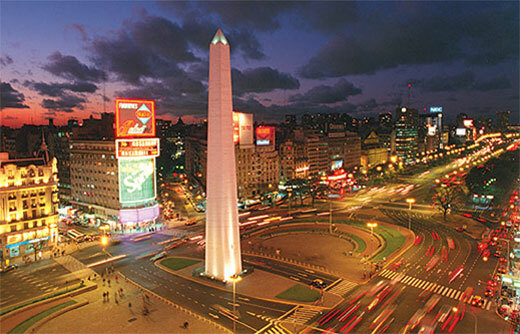 It boasts the widest avenue in the world, 9 de Julio, and the longest street in the world as well, calle Rivadavia. Buenos Aires is pulled in many directions; Spanish is the official language but is spoken with a unique accent that is more than faintly Italian, the streets look European but its problems are very much those of modern day Latin America, strains of tango are heard behind techno and cumbia beats. 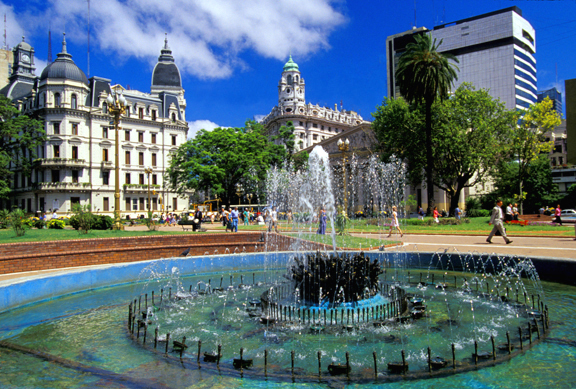 The neighborhoods of Recoleta and Palermo were historically designed by French, Spanish, and English architects, and a walk through those areas will easily bring to mind the old continent. If you head to La Boca, however, youâ€™ll see the multi-colored, seemingly thrown together conventos of early 20th century Italian and Spanish immigrants. San Telmo harbors tango dancers and a world-famous antique market. Youâ€™ll want to head to the hip neighborhood of Palermo, and the bars of Plaza Serrano to enjoy this barrio‘s slice of nightlife. During the day, head to one of Palermoâ€™s parks to soak up the sun. Stroll down Calle Santa Fe or Florida for designer shopping. Nearly everywhere one may see people everywhere just sitting down and sipping mate; this is truly emblematic of the porteÃ±o spirit, just taking a moment to stop, meet up with a friend, and chat while drinking mate or a espresso, watching people go by and commenting on life. This, more than anything, is what Buenos Aires has best to offer: a unique people, warm, enthusiastic, welcoming, fun and social, who perhaps because they have seen worse days have learned to enjoy the moment and the company of others for what they are, and who are certain to charm you with their spirit, and maybe even let some of their people-loving excitement wear off on you.